This Easter weekend is a time Christians use to remember the death, burial, and resurrection of Jesus Christ. They remember Jesus entering Jerusalem, the last super, and the crucifixion of Jesus. To so many this weekend has such great significants and is the beginning of salvation for the world. As Christians the Beyer family takes part of this Easter tradition and remembers all that they have been blessed with. 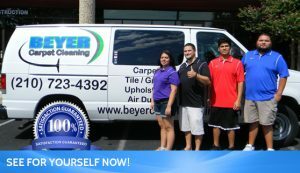 Starting this carpet cleaning business was not an easy decision for the Beyer family. To leave their comfort zone of knowing that a paycheck will come in every week from a steady job was an easy feeling. The unknown is always frightful; however, after much prayer and thoughtful planning the Beyer family became business owners who are totally dependent on the phone ringing and customers booking a carpet cleaning in order to provide for their family. Admittedly the Beyer family wasn’t sure how things would work out for them but over the past year everything has worked out so they can continue to support their family and grow the carpet cleaning business. They have been blessed to clean tile and grout for a private school, clean carpets for the Salvation Army and a few churches and businesses, and to have cleaned as many homes they have over the past year. Beyer Carpet Cleaning has been successful and are thankful to God for their continued success. They have been blessed to have had as many customers leave great reviews for them which attracts more business. They have been blessed to have such a great support system and to have people behind them that believed and still believe that they can be successful at whatever they put their minds to because God is behind them. It somehow only seems fitting that Beyer Carpet Cleaning’s one year anniversary and Easter are within the same week. The Beyer family understands and knows that not all who are reading this and that not all their customers or potential customers are believers but this does not stop them from giving everyone the same quality customer service and cleaning. They hope that their beliefs do not stop you from using Beyer Carpet Cleaning. The Beyers do not use their belief as a way to bring in or in some cases drive away customers by advertising Jesus but use their belief to provide honest, fair, and quality carpet cleaning, tile and grout cleaning, and upholstery cleaning for everyone! Happy Easter from Beyer Carpet Cleaning and the Beyer Family! Enjoy your weekend and time with family and take a minute or two to reflect on all that you have been blessed with. We guarantee it will put a smile on your face.